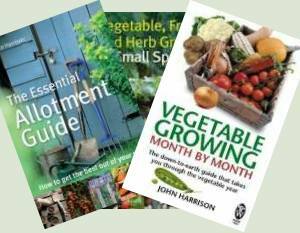 Garden Diary › Allotment Garden Diary › How Much Equipment is Enough? April’s actually getting off to a fair start – some days have been lovely and sunny although it’s living up to its reputation for April showers. 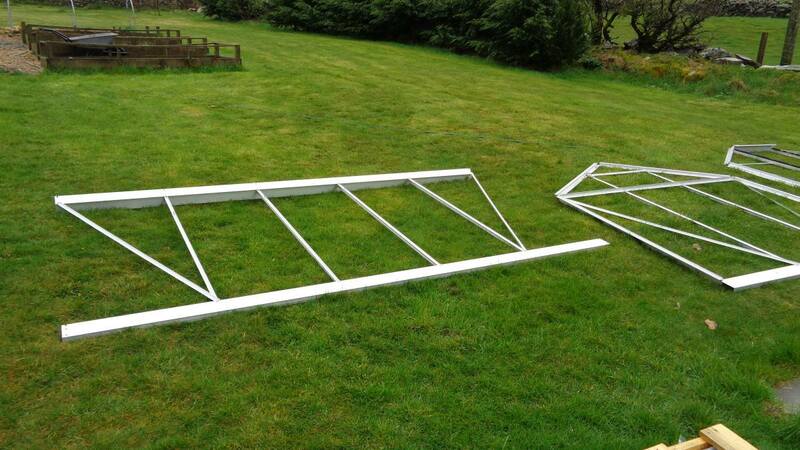 We’ve made a start on putting up the new Eden Burford greenhouse but after assembling the sides the wind was gusting too strongly to join them together. We – my son-in-law was helping me – would stand them up but the wind was twisting and trying to throw them down. I’d really hoped to have the new greenhouse up by February but things are as they are. 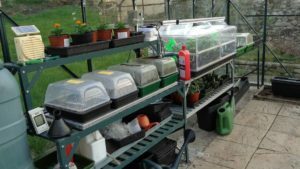 Potting Shed Propagators – absolutely full up in here. I’m short of propagating space as well. That’s despite having a a good set-up. It doesn’t help when Val returns with some plug plants from the garden centre for me to bring on undercover. They really come on well with a little additional heat and light. In total I’ve got 3 low powered electric propagators, roughly the size of 2 seed trays, which I run through a thermostat with a sensor so they’re only on when needed. 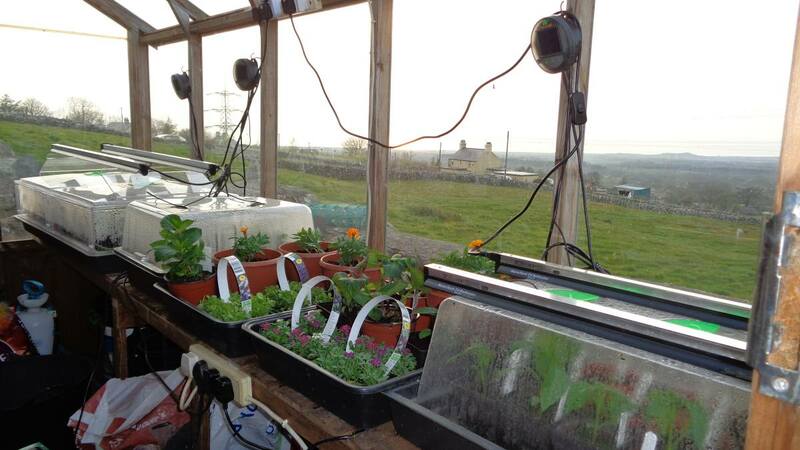 I’ve a thermostatically controlled heating base which takes 4 seed trays and then I’ve got a standard Geopod with lights and 2 double size Vitopods with lights. Now this might seem a bit excessive but first of all, look how long they last. 2 of the low powered propagators are about 20 years old. The heating base is 13 years old and the older Vitopod is 12 years old. I see no reason why they shouldn’t go on for at least another 10 years. With a 20 year life, the cost per year is minimal. The next thing is space. 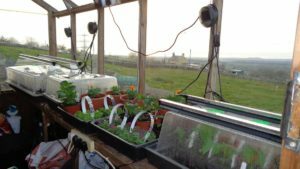 In our last house we had more room and even set up shelving by the patio doors in the lounge with seed trays and seedlings. I love it where we are but it would have been even better is we could have just picked up our old house and moved it. We lack suitable indoor space now. 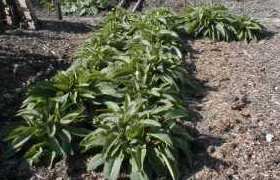 Finally, compared with most hobbies or a night out, gardening is pretty cheap! Of course, there is another element to my investment in growing equipment. I’m prepping. Not so much for the zombie apocalypse as retirement which isn’t that far off now. You never know what the future may bring, but at least we can feed ourselves, come what may. 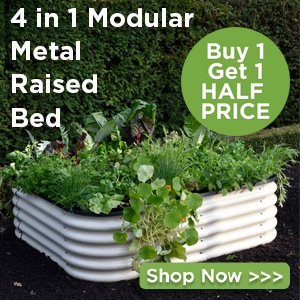 As far as I can see, you have the amount of kit required to start off the amount of plants you are going to actually grow, plus of course the “spares” to cover emergencies and for swapsies. I have far less kit, less growing space and less mouths to feed. I know how you feel. When we were putting up our two large greenhouses we had to contend with rain storms, cold winds and that was only putting up the frames as for installing the glass! Enough said. An old gardener told us you never have enough space in the greenhouse when growing your own and he’s right. When the plant season really gets into swing no sooner are the seedlings up they need pricking out. Pots, trays and compost everywhere but I have to say you’ve got a good set up with your propagators something we haven’t actually got into. Anyway I wish you luck getting the greenhouse up and running.